Über-restaurateur Alan Yau has done it again. He is renowned for setting up — or being associated with — Wagamama, Hakkasan, Yauatcha, Busabai Eathai, Sake No Hana, Cha Cha Moon, Princi and, more recently, the short-lived Naamyaa Café among others. And if reports in the trade press are to be believed, pretty much every other restaurant opening this year will be owned by Yau. He specialises in both fast-casual and high-end; and this newly opened ‘Turkish pizza’ joint firmly falls into the former category. Like ‘Greek pasta’ or ‘Japanese curry’, ‘Turkish pizza’ sounds gimmicky; yet like both, it’s highly traditional. 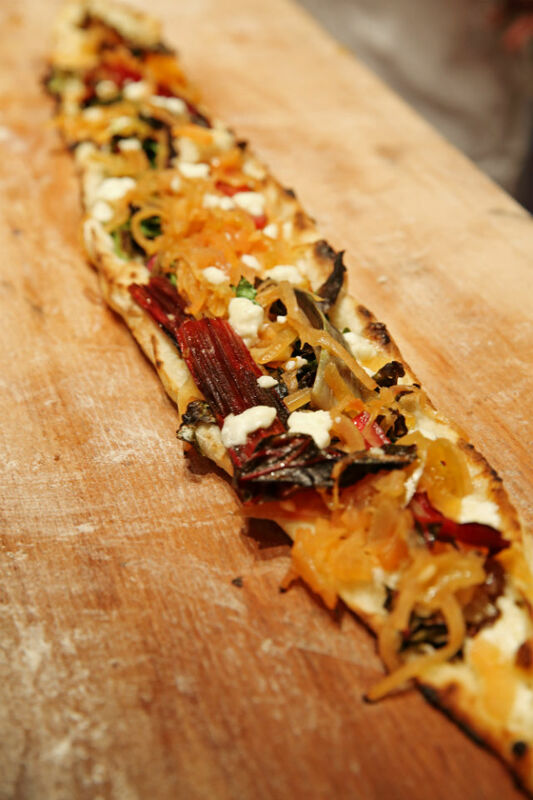 The 'pizza' is in fact pide: a variant of the more familiar Greek pita. It’s a leavened flatbread shaped like a boat — or a pregnant baguette — cooked directly on a hot surface. Dating back thousands of years, it’s found in the Balkans, the Eastern Mediterranean, the Middle East, and Central and Southern Asia. There are several varieties — and this one with toppings, said to have emerged around the 16th century, is the Black Sea version. ‘Pide salons’ — the equivalent of pizza parlours, but even cheaper and more casual — started cropping up in Istanbul in the 1960s and 70s, and this buzzy newcomer is a chic London take on the popular Istanbul ‘pide salonu’. Babaji — the word means ‘father’ in Turkish and many other languages — is somewhat incongruously located on touristy Shaftesbury Avenue, but it’s really a Notting Hill restaurant at heart. Decked out in sleek, shiny blue tiles, it has a more relaxed dining room on the first floor and a cosy, plate glass window-wrapped ground floor, dominated by a wood-fired oven that looks like an over-sized egg. 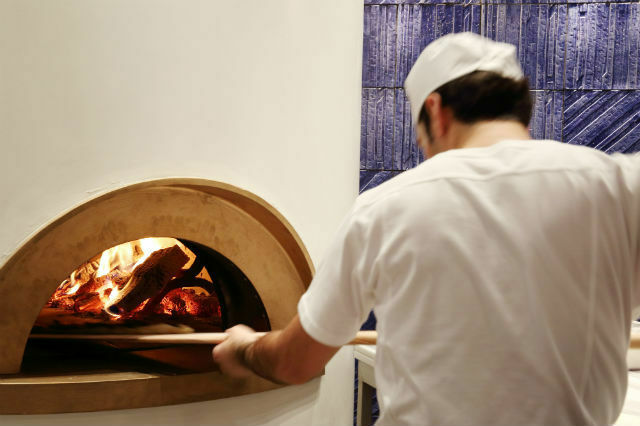 Not wanting to miss out on the pideci (pide chef) action, we sat right opposite the oven and watched as a team of chefs rolled and flattened and pinched the dough into shape, moving it to and from the hot flames in swift movements. But first, we couldn’t resist the meze, and like in many restaurants, most here are vegetarian. There are slightly smoky baby artichoke hearts with paper-thin half-moons of burgundy-bright beetroot, given salty spritz by little nuggets of capers. Long strips of peeled scarlet peppers come with frilly spinach stems that look like baby pak choi: a dish that wouldn’t look out of place in one of the Chinatown restaurants across the road. The peppery anise flavour of dill fronds livens up a mild mix of jerusalem artichokes, broad beans, red peppers, cubed carrots and whole baby potatoes. Chunkily diced soft flesh of roasted aubergines with pomegranate dressing — and yes, more red peppers — brings another level of smokiness and tang altogether. The flavours are fresh and light and the colours vivid, as if someone’s opened up a box of jewels and spilled the entire contents on our table. The delicacy and daintiness of each meze belies the fast-casual nature of the venue. At this point, however, there’s a glitch in what is otherwise brisk, efficient and friendly service (from staff attractively attired in black-and-white uniforms, based on traditional costumes). Feeling somewhat pressurised to order the pide at the same time as the meze (“the chefs need time to cook them”, said our server), we'd emphatically asked for them to be served after the meze — but they arrived halfway through. They were swiftly taken back “to be kept warm”. Cut up into slices and served on greaseproof paper with a wedge of lemon and a small hillock of flat-leaf parsley, they were absolutely fine, but it bugged us that we didn’t get to try them fresh from the oven, and had to contend with the reheated version instead. The pide have a puffy, bubbled surface that’s soft and cushiony and crisp around the edges. A topping of chargrilled courgettes with tomatoes, goats cheese and coarsely crushed walnuts transports us to sunnier Mediterranean climes; and another one, of caramelised onions and golden sultanas, has enough sweetness to cut through the savouriness of feta and swiss chard. We squeeze some lemon, pile on the parsley, and roll them up lahmacun-style (another style of Turkish pizza). The food here is bright and cheery, but the vegetarian dishes don’t have many variations in terms of taste and texture; and certain ingredients like red peppers, beetroot and feta recur frequently. To finish, the thin, crisp filo pastry of own-made baklava is almost bursting at the seams with finely ground pistachios (we get some finely ground pistachio shell, too, but at least it shows the nuts are fresh). The accompanying ‘clotted cream’ ice cream (no doubt Turkish kaymak) is rich without being unctuous. Although a little runny, the mellow, creamy rice pudding with sour cherries is comfort food at its best: a lullaby in a glass. We drink smooth, cloudy Yeni raki (a top brand in Turkey), in which the anise flavour doesn’t overwhelm, with the meze; and with the pide, a pleasantly spicy red from an all-Turkish wine list. Linden blossom, ginger and honey tea, served with thin slices of apples and oranges, is another delight. We paid around £35-£40 each for many different dishes, drinks and service — but you can eat far cheaper. This being a Yau restaurant, attention to detail abounds. The ginger juice used in the linden tea, for instance, is freshly pressed in-house; and a curtain shields diners at a corner table with glass windows on either side, so they don't have to feel like they’re in a goldfish bowl. The lighting is not too dim and not too bright, but just right. Tables are close together but with enough space between them, so that you can be cocooned from other diners and only hear your own dining companion, not everyone else’s. Turkish pop music isn’t played too loud (and we particularly enjoyed the Turkish rendition of I Will Survive). 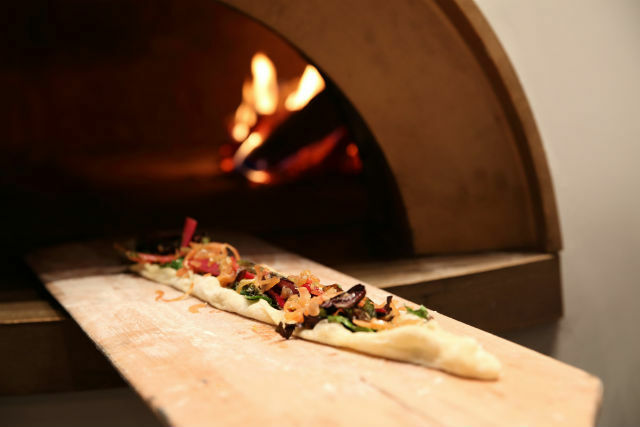 Babaji isn’t London’s first pide restaurant — there are a few dotted around north-east London — but it’s certainly the most glamorous. And it’s a lot of fun. It doesn’t take bookings, but we visited on an early weekday evening so we didn’t have to queue. It’s not a place to linger but if you’re in the area, go with a bunch of mates or just pop in on your own. Surrounded by gorgeous iznik-design pottery in which the food is served, the clink of sparkling cut-glass jugs and gilded tea glasses in which the drinks are poured, the smoky aroma and the curiously retro music, you can pretend to be an impossibly beautiful character in an Orhan Pamuk novel. We review strictly anonymously, and pay for all the food, drinks and service. Images supplied by the restaurant.